Switch open beta set for August. Base Goku and Base Vegeta are the next two characters to join Dragon Ball FighterZ as downloadable content characters, the latest issue of V-Jump reveals. Both characters are due out in early August for 500 yen each. Kaio-ken: After activation, Goku can perform consecutive attacks using a combination of buttons. If his allies are killed, his power will increase three or 20-fold. Super Spirit Bomb: The strongest among all of Goku’s technique, but its speed is slow. Galick Gun: Fires energy at the ground. This can also be used in the sky. Galaxy Breaker: Fires off energy from his entire body. 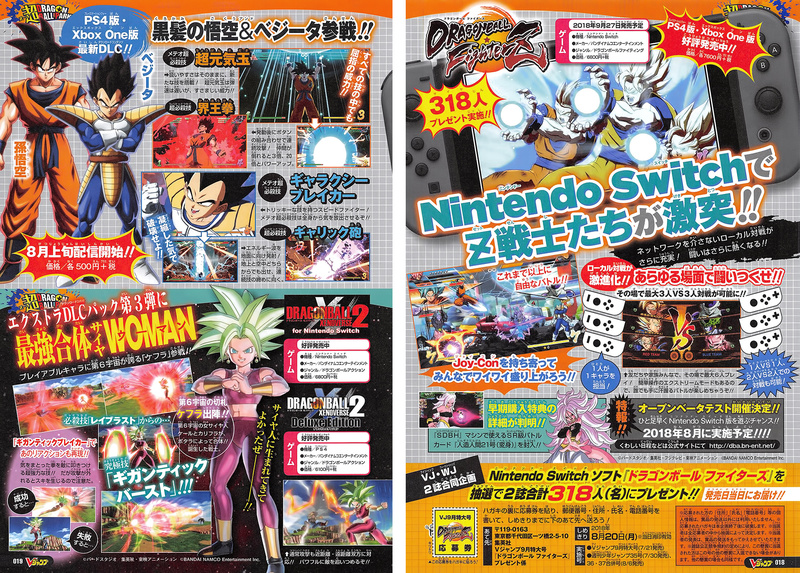 The magazine also reveals that an open beta test for the Switch version of Dragon Ball FighterZ is planned for August. It will support local three-versus-three multiplayer. Update 10:10 a.m.: Scan added.